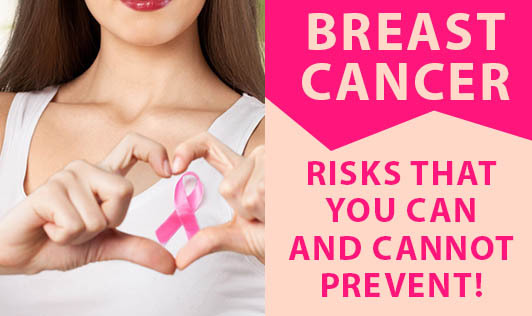 Breast Cancer Risks That You Can And Cannot Prevent! There are many risk factors for breast cancer. Having one or more risk factors always does not indicate that a woman will develop breast cancer. Let's have a look at some of these factors. Gender:Being a woman is the most significant risk factor for developing breast cancer. Although men can get breast cancer too, women's breast cells are constantly changing and growing, mainly due to the activity of the female hormones estrogen and progesterone. This activity puts a woman at much greater risk for breast cancer. Age: The risk increases as a woman ages. Women above 40+ years are more prone to the risk, but breast cancer tends to be more aggressive in younger women below 35 years of age. Family history:If you have a mother, sister or daughter with breast cancer, there may be a greater chance for you to be diagnosed with it. Inherited genes: There are certain genes that can be mutated, which increase the risk of cancer and this gene can be passed from parents to children. Weight: Being overweight, is associated with an increased risk of breast cancer, especially for women after menopause. Fat tissue is the body's main source of estrogen after menopause. Having more fat tissue means having higher estrogen levels, which can increase breast cancer risk. Diet:Diet is a suspected risk factor for many types of cancers, including breast cancer. But there are studies going on that are yet to show what types of food increase the risk. It is still a good idea to restrict sources of red meat and other animal fats. Alcohol consumption:Risk increases with the quantity of alcohol consumption. Post-menopausal hormone therapy:Women, who are on hormone therapy medications that combine estrogen and progesterone to treat the signs and symptoms of menopause, have an increased risk of breast cancer. So, choose your lifestyle and prevent the risk!